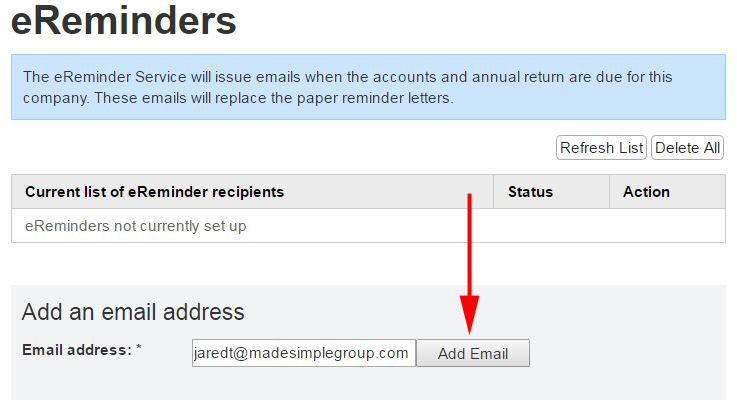 The eReminder Service will issue emails when the accounts and the confirmation statement are due for your company. All the emails are sent directly from Companies House and will replace the paper reminder letters. Please note that the eReminder Service only covers annual accounts and confirmation statement reminders. Therefore, you will need to keep on top of other annual requirements. It's recommended to not just rely on reminders, but to make note of each annual requirement due dates to avoid penalties or dissolution of your company. Go to My Companies (login required) and click your company name. In the top right-hand corner, click the Quick Links arrow and select eReminders. Enter your email address and click Add Email. You'll be sent an activation link in the email which you will need to agree to before the service is activated. 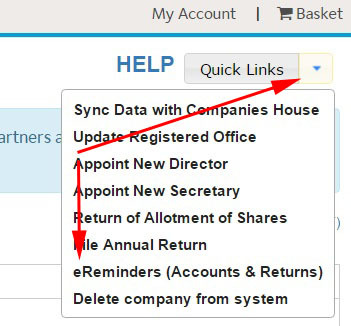 The email address from which Companies House will send the eReminders will end with “@companies-house.gov.uk”. You should ensure that such emails will not be removed by your spam filter. Should you wish to unsubscribe from the service completely, just click Delete All. Alternatively, you can click ‘unsubscribe’ at the bottom of the reminder email.